Well, not exactly. 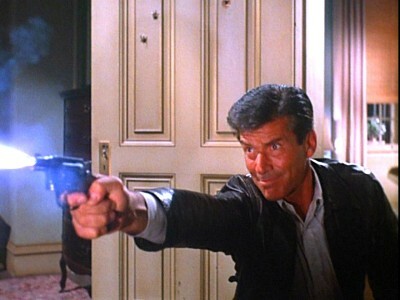 But the Quinn Martin-produced series The Fugitive, the first big hit for Martin’s QM Productions, was winding down its four-year run when it filmed the concluding scene to an episode. David Janssen as Dr. Richard Kimble, was walking down a city street. The filming site was Metro-Goldwyn-Mayer’s “street set,” originally to duplicate a New York City street. QM’s art department apparently was asleep at the switch. It failed to removed the set dressing from another show produced on the same set: the Del Floria’s tailor shop sign from The Man From U.N.C.L.E. The tailor shop was the “security entrance” to U.N.C.L.E.’s New York headquarters. Here’s a video, albeit not good video quality, of the scene from The Fugitive. 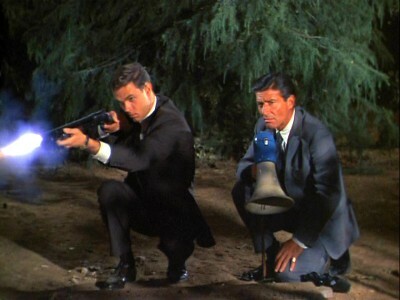 According to the For Your Eyes Only Web site’s 100-year timeline showing U.N.C.L.E.-007 interactions, The Fugitive episode aired on April 4, 1967. If correct, that would be an episode called The Walls of Night. Based on the credits, that would indicate that set decorator Sandy Grace was the one who failed to notice the Del Floria’s sign. 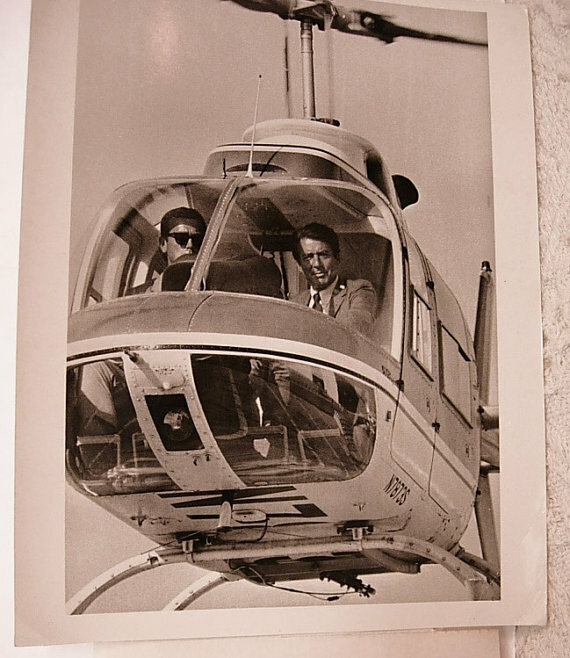 Then again, one-hour drama shows were shot in five or six days in the 1960s and had really tight deadlines. Also, according to For Your Eyes Only, The Fugitive episode aired just a few weeks after a March 1967 fire destroyed the street set. In The Man From U.N.C.L.E.’s fourth season, the show had to use footage from previous episodes to depict the exterior of U.N.C.L.E.’s heaquarters. By this time, Quinn Martin had sold his company. So while it’s listed as being “A QM Production,” he wasn’t around for this. QM’s T.R. Sloane character was picked up as a series, but not until a lot of reworking. 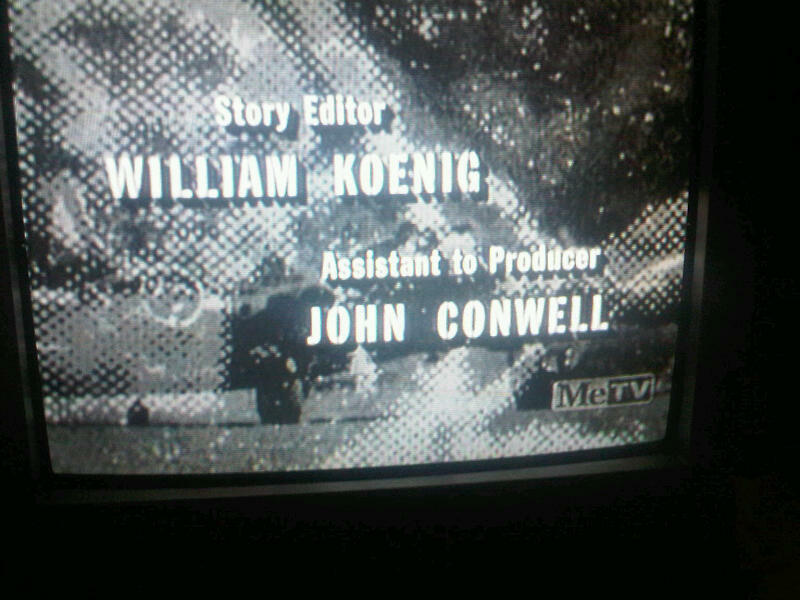 The lead was recast with none other than Robert Conrad. A villain in “Death Ray 2000” was turned into T.R. Sloane’s sidekick. Dan O’Herlihy as Sloane’s boss was retained, but got a shave and moved his office behind a toy store front. 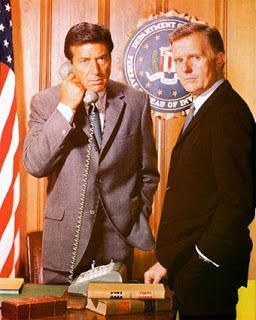 “A Man Called Slone” didn’t last long, getting canceled after 13 weeks of the 1979-80 TV season.